The decorative technique of Sadeli is a type of micro mosaic with repeating geometric patterns. It has had a long history in India and the Middle East with early examples dating back to the 16th century. It is a highly skilled craft and became very popular in 19th century Britain as many boxes, card cases and chess boards were imported from India. 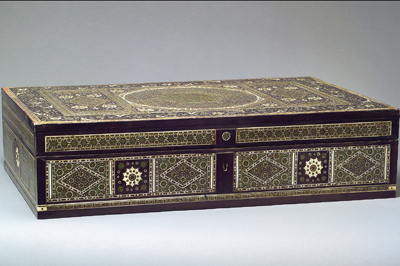 Bombay became a centre of making and these imported wares became known as Bombay boxes. Whilst the technique may at first seem exquisitely complex, the theory is relatively simple. 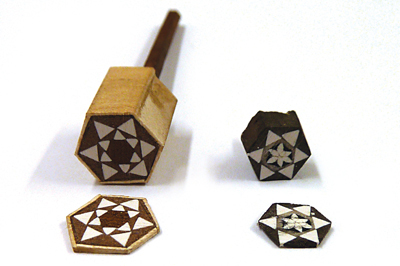 A stick is made up of long thin rods of many materials which are then cut transversally to form a repeat pattern. This is essentially the same as a stick of Brighton rock where the letters are embedded throughout the whole stick. a diverse variety of geometric patterns can be made up. Woods used include ebony (Diospyros spp.) and rosewood (Guibourtia demeusei) with green stained bone and ivory. If tin or pewter were used they would have been extruded into circular or triangular rods, then once a supply of rods had been produced the craftsman could build up the stick, joining the lengths with animal glue. When the packet was completed it could then be sliced up with a fine saw and the pieces arranged and glued down on to the box. Any slight variations in surface height would be levelled by scraping. The technique is still practised today in Iran and other countries in the Eastern Mediterranean. Modern materials have superseded the traditional with plastics - often extruded acrylic - substituting endangered ivory and ebony. A combination of rods and thick coloured paste epoxy can also be used to build up a stick quickly. This writing box is an early example of the technique, thought to be late 16th/early 17th century. The majority of the boxes found in the antiques market today are early-to-mid 19th century. This box is Indian, either from Gujarat or Sind. In this example, stained ivory and bone are used with different woods and brass. On the top the geometric decoration is contrasted with a border of flowing and curving inlay.